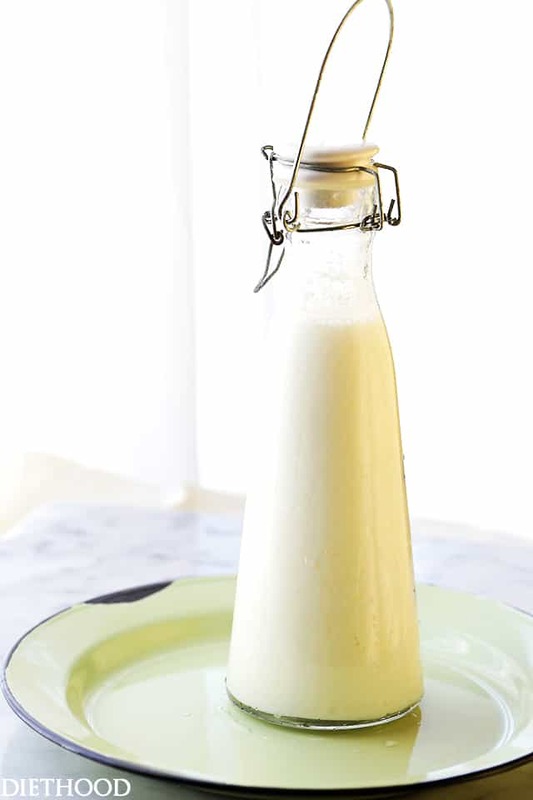 How to make Buttermilk with just 2 ingredients: Milk and White Vinegar. Hi Hey Hello! I’ll hold on a minute while you grab some milk and vinegar. Too bad it’s only Wednesday… let’s just pretend. On that same note, nothing makes me more angry than opening up the fridge only to find a drop of buttermilk in the carton. I’m fuming at just the thought of this injustice. 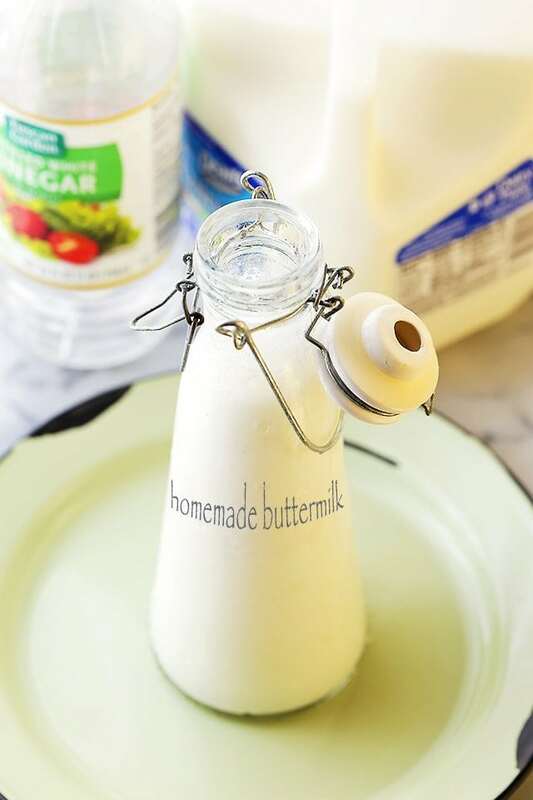 Luckily for us, it’s super easy to make a very quick buttermilk substitute in minutes, in our own kitchens, with just two ingredients that we always have on hand; milk and white vinegar. The importance of buttermilk in almost any baking recipe is to add tenderness and lighten the batter. Whether you’re making sweet rolls, pancakes, or Soda Bread, buttermilk aids in leaving our baked goods airy, tender, and delicious. 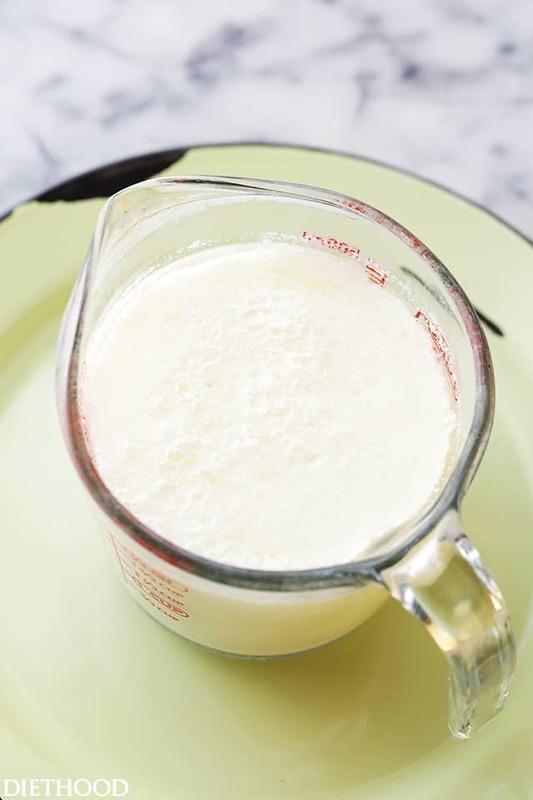 You will only need a 3 tablespoons white vinegar and 2 cups of milk; mix it together, set aside, and 15 minutes later you’ve got BUTTERMILK! I use this recipe regularly for pancakes, biscuits, breads, and so on. Note that this recipe doesn’t make a thick and creamy buttermilk, however it does perform its role in baked goods. It’s also a life-saver when you’re craving pancakes, but the buttermilk carton is empty. 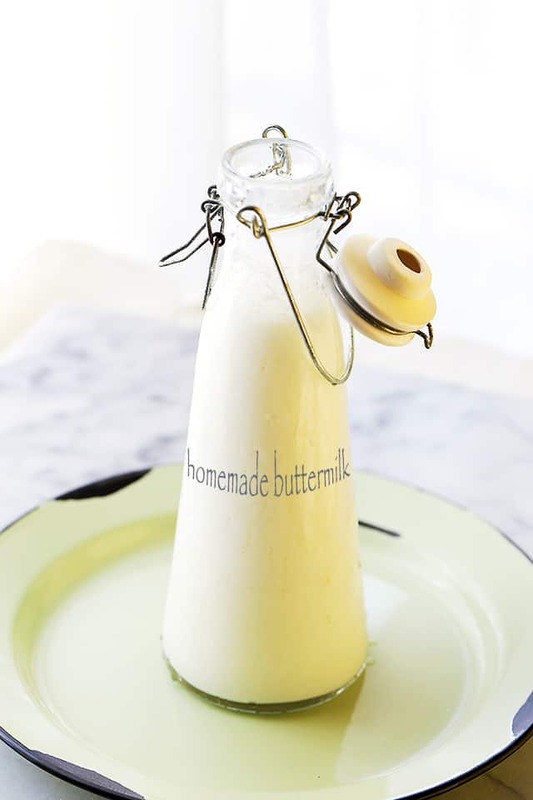 How to make Homemade Buttermilk with just 2 ingredients: Milk and White Vinegar. 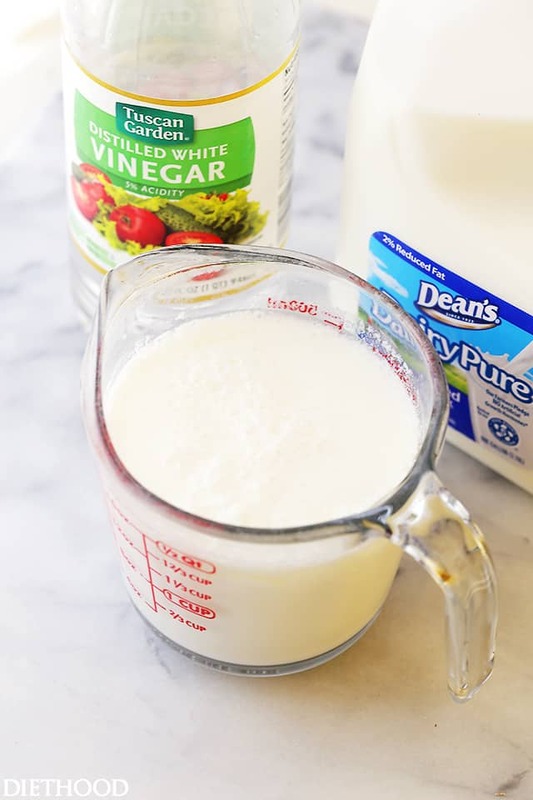 Place the white vinegar in a glass measuring cup. Add enough milk to make 2 cups total. Stir to combine and let stand 15 minutes. The mixture will begin to curdle. Use right away, or cover and refrigerate. This substitute does mimic the function of buttermilk, however it does lack that buttermilk flavor. This is a great substitute for when a recipe calls for buttermilk, but you don't have any on hand. ty for the recipe,I also saved it or future recipes. 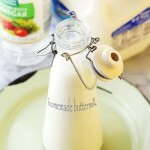 I was wondering about the cute jar,what size is it and did you write homemade buttermilk on it or did you buy it that. Best recipe for yummy Buttermilk. Thanks for sharing. This is amazing!!! I’ve got to try this!! Thanks, Katerina! Thank you so much for this recipe. We are trying to eliminate processed foods so this is a great addition to our box of homemade recipes! By the way where did you get that cute bottle? Could I use this when doing fried chicken or does it need to be thicker and creamier like actual buttermilk? You can definitely use it as marinade for fried chicken. This diy buttermilk works best for cooking. I like this method for years then one day I had no vinegar. I always have sour cream on hand so used 1/4 cup sour cream in a measuring cup and added enough milk to make way cups. Stir briskly with a fork. Set aside for 15 minutes. The flavor difference was notably more tangy like buttermilk. YAY! I’m so glad that you posted this! I’m always in need of buttermilk and it’s always the one thing that I forget at the store! Yes! I never quite get the measurements correctly on this – thank you for getting it down to a science! I almost never have buttermilk on hand and have to make my own. It’s recipe every home cook needs. One of the great virtues of making your own buttermilk is you can make exactly how much you need for a particular recipe. Very practical post! We never keep buttermilk on hand because I can’t find small enough jugs and it ends up going to waste. I use this trick often but always have to google it. Pinning to save for later!